This town sure loves its Coffee – (part 1)! One of my favorite things to do when I arrive in a new city is to get coffee. Not “multi-million dollar food-chain” coffee, but “local, independently owned coffee shop” coffee. I’ve found that visiting an Independent coffee shops gives you a hint of what the community has to offer. There are no less than a dozen in Moncton. So after moving here, one of the first places I visited was the popular Café Codiac. Coffee beans ready for roastng. My first impression was how spacious it was, with lots of room for everyone for a variety of clientele. The café has ample seating and big bright windows that exude a warm and friendly vibe. They day I visited the shop was filled with seniors, moms with strollers, students with iPads and local business people. And then there was the smell. With coffee beans roasted right on site, the aroma was intoxicating. Owner Cayley Montague was kind enough to give me some insight about his shop and Moncton’s coffee culture. “Monctonians love their coffee.” he says. And at his shop, “the darker the better”. The popular Codiac Black Blend is the cafe’s most requested offering. Café Codiac prides itself on roasting its beans onsite so customers are sure to get the freshest cup possible. Every Tuesday this roaster is working away! The decaf coffee is one of my favorites from the Café. Robust and fresh, it tastes fantastic and, being decaf, I can drink it without guilt as an afternoon treat. 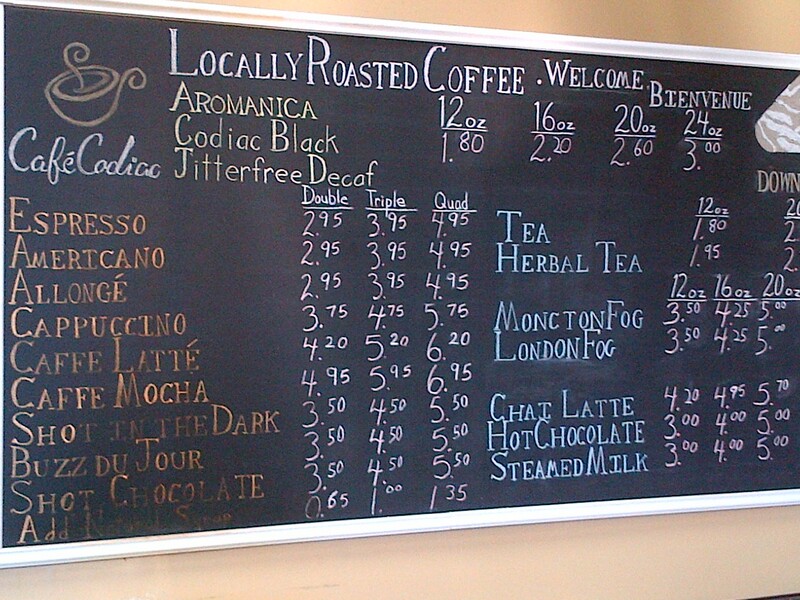 Café Codiac is an extension of the Down East Coffee Company, one of New Brunswick’s pre-eminent coffee roasters. 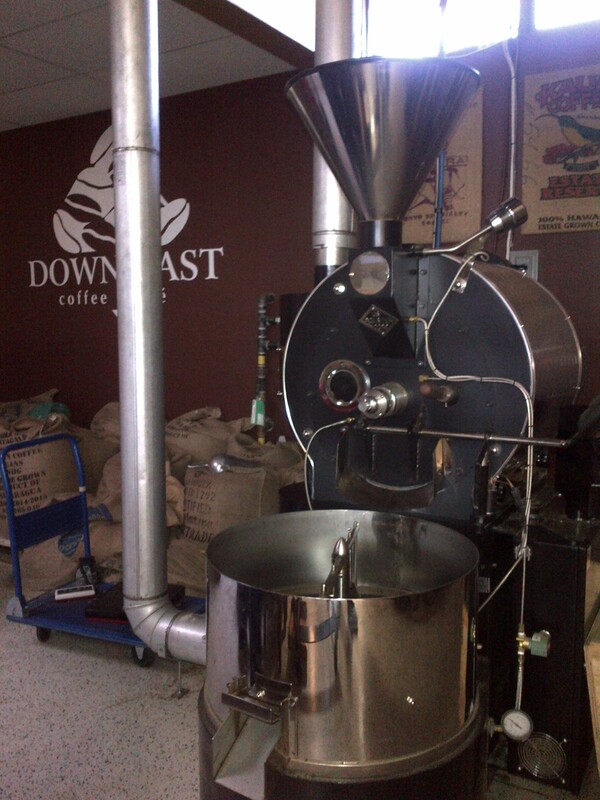 Headquartered in nearby Notre Dame, Down East has been roasting beans for 20 years, and providing quality coffee to shops and restaurants across the province. 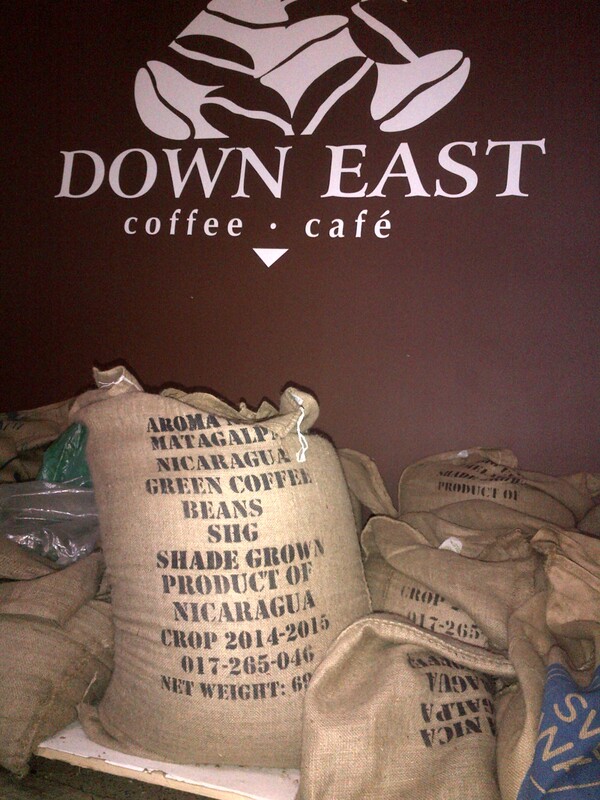 Down East has also had a long-time presence at the year-round Moncton Farmers’ Market. If you want a little snack to go with your drink, the shop’s food menu offers wholesome, additive-free baked goods, smoothies, and fresh-daily soups and sandwiches – all made from products supplied by local vendors. 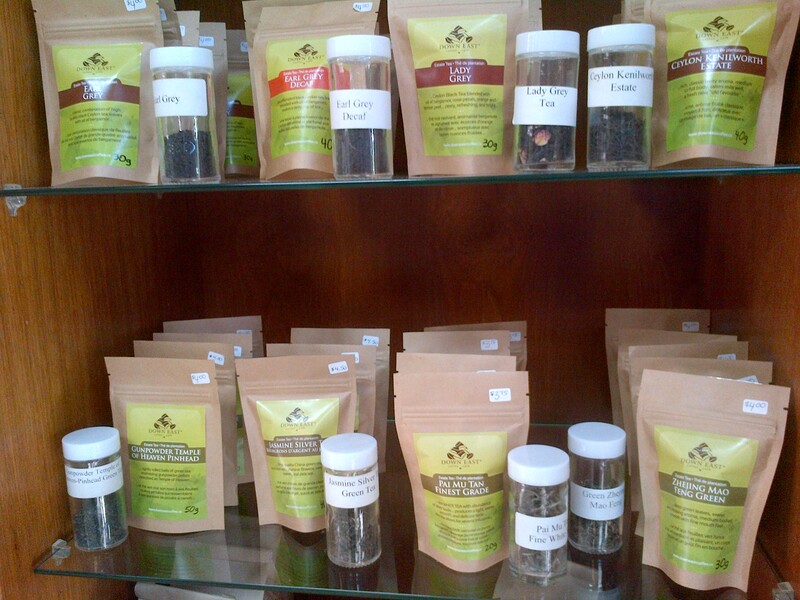 If you are not a coffee drinker, check out the great selection of teas. Another unique feature of Café Codiac – its one-of-a-kind drive-thru service. Like the shop itself, the drive-thru is a unique experience. Drivers pull up to the window and ring a doorbell. This service is Moncton’s first and only independent drive-thru. It’s probably also the friendliest as drivers are face-to-face with a real person when they give their orders. “Our drive-thru definitely offers a little more of a human or personal touch than what’s out there,” he says. And it’s that personal touch that keep customers, like me, coming back. Corner of St. George Street and Mount Royal Blvd. Stay tuned here and I’ll post more coffee shop adventures in the future. 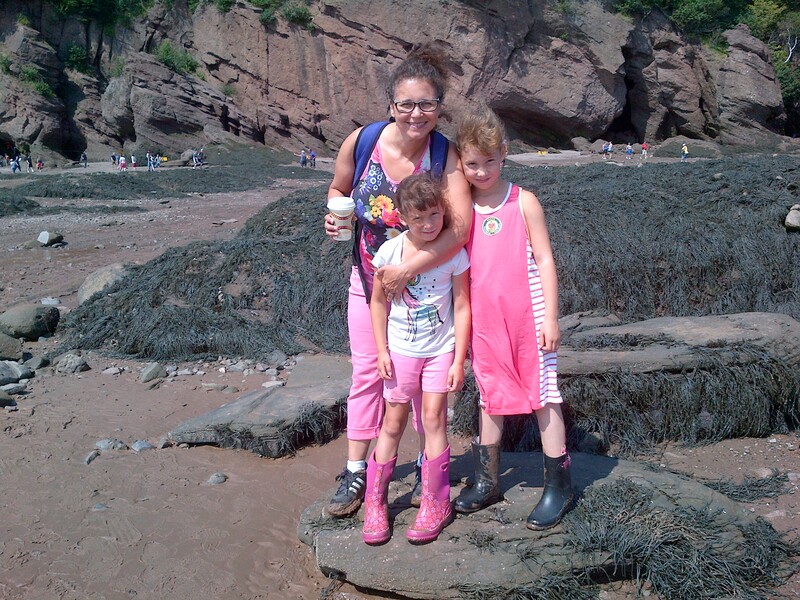 Summer in New Brunswick would not be complete without a visit to Hopewell Rocks. Even though I’ve been there at least six times, the Park always offers a little something new with each visit. I never tire of the view at low tide while descending the winding metal staircase to the ocean floor. The Flower Pot Rocks look just like a postcard. Gorgeous. The famous Flower Pot Rocks. Last week, we visited again with a friend and we were fortunate enough to have perfect weather – not too hot or windy. This makes all the difference as the temperatures are always a little cooler along the Fundy coast. On clear days you can easily see Nova Scotia and may catch a glimpse of a whale or two in the twinkling waters of the Bay (I swear it twinkles)! For many tourists, the scenery is the attraction. At low tide, the beautiful rock formations are on display with sea and sky in the background. But upon closer look, the ocean floor is bursting with life. Thousands of tiny snails and a variety of crab species dot the landscape. They’re easy to miss, but once you spot them, it’s hard not to see the entire ocean floor as a moving, living thing. Hangin’ with the seaweed on the ocean floor. Then there’s the seaweed. There are two common types. One has little balloon-like bits on its tips to help it float to the water’s surface. The other has mitten-like formations that contain a thick substance that is commonly used in skin care and other products. After many visits, I’ve learned that getting dirty is part of the Hopewell experience. There is mud by the water’s edge and it is deep. Throw in some slippery seaweed and you have a recipe for disaster! We usually come back dirtier than when we arrived but luckily there are cleaning stations at the top. There is a lot more to the Park than just the the Hopewell Flower Pot rocks. I have not done all the trails in the area, but they lead to a number of other coves, such as Diamond Cove, Castle Cove and Big Cove. I intend to explore them one day as well as visit as the tide is rushing in. 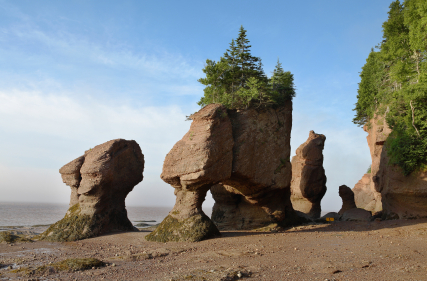 If you have a chance, check out Bay of Fundy’s Hopewell Rocks by Kevin Snair. He is an interpreter at the Park who is passionate about the site. It contains some great information about the Park, and the photos throughout are simply stunning. You’ll also learn the many quirky names given to the rock formations. “ET” is my favourite! Once you head back to the entrance, don’t miss the excellent interpretation centre as well as the restaurant and gift shop. 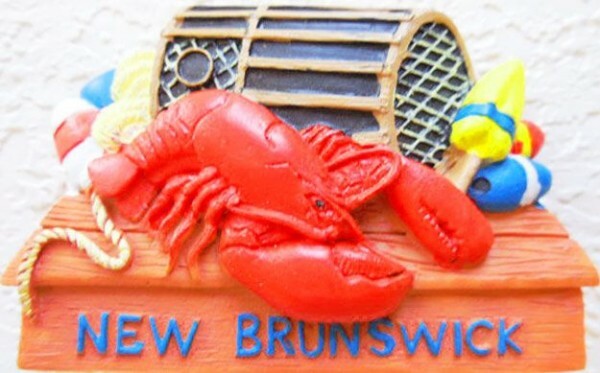 The restaurant serves some delicious east coast favorites while the gift shop has every maritime souvenir imaginable. As I’ve mentioned in other posts, Moncton is one of Canada’s best kept secrets. We don’t have a giant tower or an internationally acclaimed museum or a dozen Michelin-rated restaurants, but we do have great people. And according to a reporter for UK-based The Guardian newspaper, this counts for a lot. Vancouver was more beautiful, Montreal more chic, Ottawa more interesting and Edmonton – well Edmonton had more tall buildings – but Moncton in New Brunswick was the most charming venue of Canada 2015. Virtually everyone, everywhere, was friendly but in Moncton people are super friendly. If drivers see you hesitating on the pavement (sorry, sidewalk) and think you might want to cross the road, they stop for you. It also had by far the best newspaper of any read at breakfast in the five cities I visited – so hats off to the Times and Transcript. Pretty nice I think. Here’s a link to her entire article..
Our First Canada Day in Moncton, and what a lovely time it was! The City’s “Whoa Canada” day of activities took place along the riverfront, one of the best gathering spots in the community. The entire waterfront was a sea of red and white with thousands turning out to mark Canada’s 148th birthday. The City of Moncton did not exist when Canada was born, but the province of New Brunswick was a key player in Confederation. Initially, New Brunswick led the charge for a maritime union with Prince Edward Island and Nova Scotia. When the Province of Canada (Ontario and Quebec) requested to take part in the meeting, talk soon turned to forming the country of Canada. In 1867, three years after the historic Charlottetown conference, the country of Canada was formed. Bouncy castle heaven on Canada Day. I am willing to bet the Petitcodiac River looked very much back then like it does today. Muddy water rising high and then dropping low, swirling pools winding their way down to the Bay of Fundy. During today’s celebrations, the tide was low. 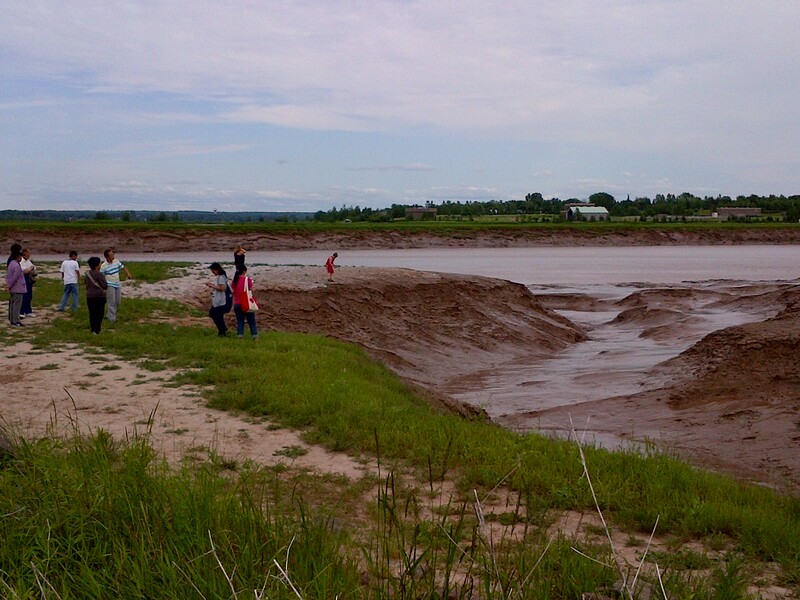 Soon the tidal bore will make its way along and the gushing water will rise to the river’s edge. The river is certainly an active member of this community. Hanging along the banks of the Petitcodiac River. 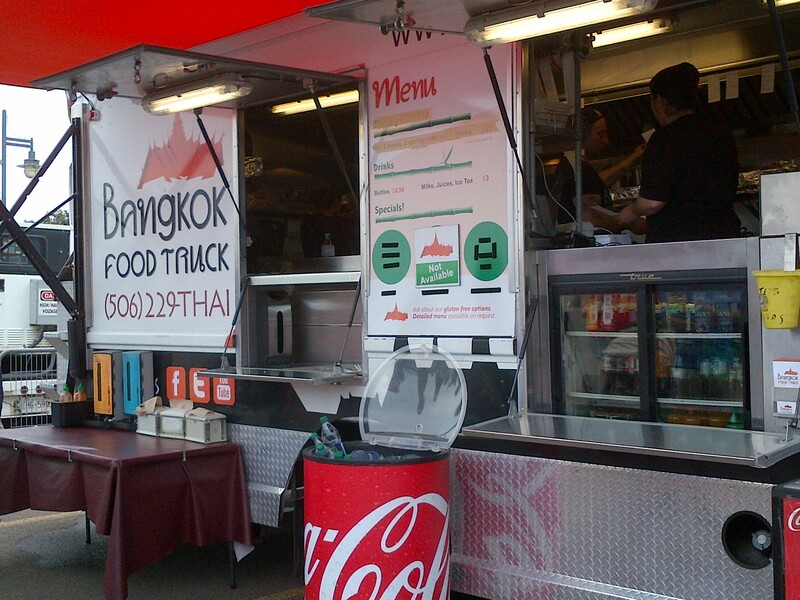 A parking lot full of food trucks adds some diversity to the traditional maritime offerings – Thai food, Mediterranian fare and German sausage that caught my eye. While the City’s ethnic communities are not front and center, these food trucks hint at a growing community that is becoming more sophisticated in its culinary tastes. One of my favourite food trucks in the City. International flavours indeed! I’ve been fortunate to attend many Canada Day ceremonies across this country – in Newfoundland, Canada’s youngest and most easterly province; Ottawa, Canada’s captial; at the Toronto’s CN tower; and in Charlottetown in 2000, the millenium year. In comparison, Moncton’s Canada Day activities certainly didn’t disappoint. There were plenty of good food options and and many fun family activities, including a kids zone with puppetry and other performances. Shop vendors sold everything from patriotic t-shirts to air-brushed tattoos. 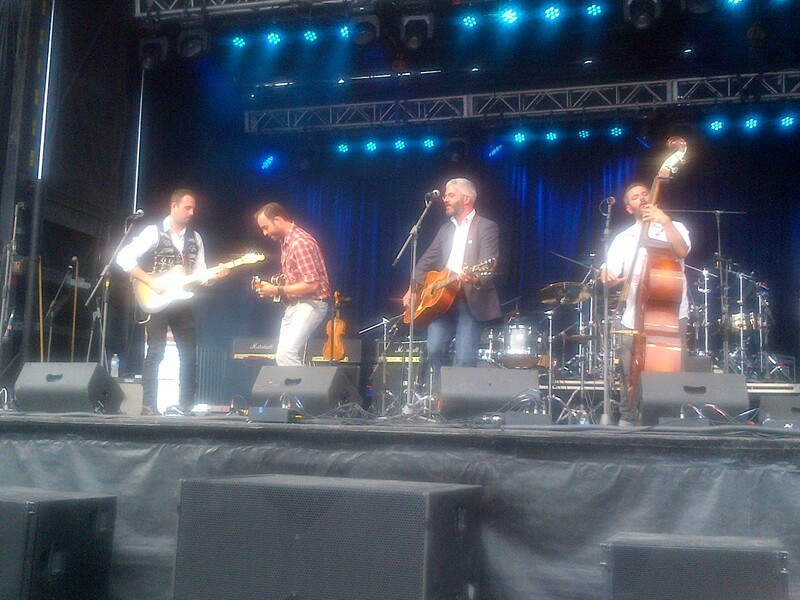 The larger stage featured musicians who represented New Brunswick’s English and Acadian cultures. The night ended with a performance from classic Canadian band Trooper, along with a great fireworks display. The Backyard Devils got everyone up and dancing. Iconic Canadian band Trooper were the headliners. The best part? The friendliness and laid-back attitude that accompanied the events. Acadian and English, old and young. Everyone was there to have fun. A great day in a great city. 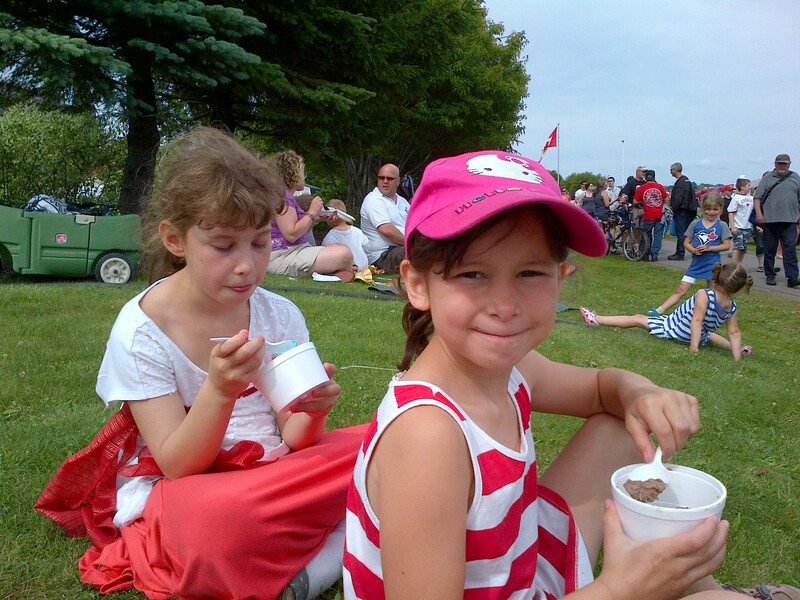 Enjoying ice cream on a gorgeous Canada Day along Moncton’s Riverfront. Spin-It Records and Video – Moncton’s coolest and kitschiest shop! One of the best things about moving to a new city is discovering all the fun little places that don’t always make the tourist guides. Spin-it Records and Video is one of my favorite shops in Moncton. This might be because I love movies and music or it m ight be because I’m over 30 and my childhood days are far behind me! But if you ever want to relive those happy days of childhood, this is the place to go. 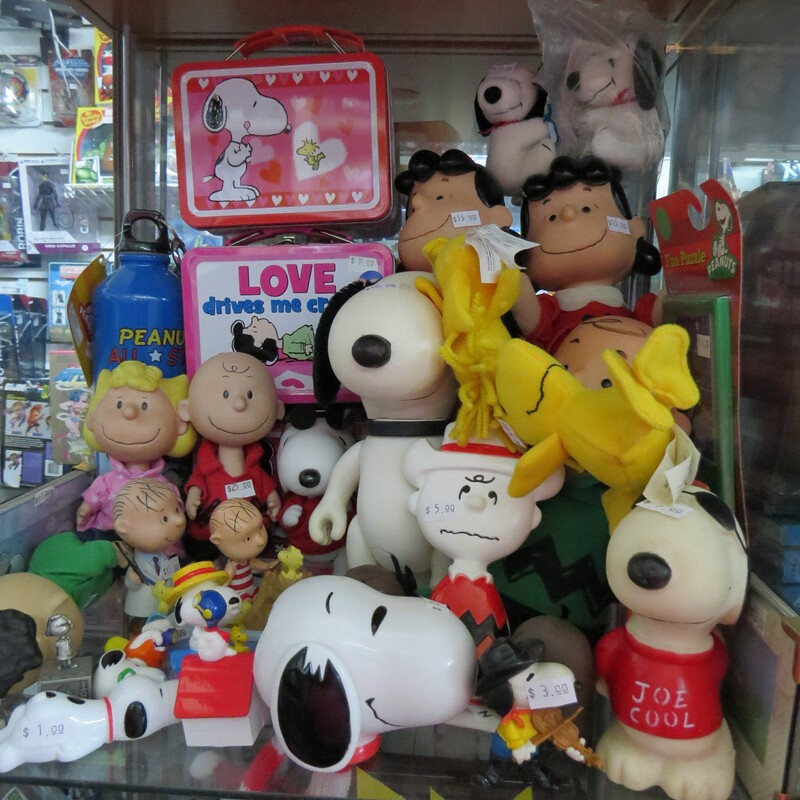 Store owner Patrick Parisé has one of the greatest collections of pop culture kitsch that I have ever seen. Missing a specific Smurf from your collection? He probably has it. Do you long for your old tin Snoopy lunch box? He has that too. What about the original Wonder Woman poster you had in grade six? Just ask Patrick. If he doesn’t have it, he’ll find it for you. Spin-it started out nearly 15 years ago as a record store that specialized in selling old and new vinyl records. As business increased, Parisé, who is also a serious movie buff, decided to rent out his collection of 4,000 DVDs. Weekend line-ups to rent his movies were so long that he decided to open up a large shop that supported all three of his passions – music, film and pop culture. If you get the chance to visit, give yourself some quality time to look around. The front is a video store that contains nearly 40 thousand movies geared to cinephiles. Films are categorized according to genres, directors, countries they hail from and festivals they were featured in. Plus the place smells of freshly popped corn. Past the video section is what looks like pop culture warehouse. Superhereos, Care Bears, 70s concert t-shirts, movie memorabilia – it’s all there floor to ceiling. At the back of the shop you will find a fantastic selection of vinyl records. Parisé carries new releases as well as tens of thousands of original vinyl records. He’s the master DJ of the store’s record player, introducing customers to new and old music. 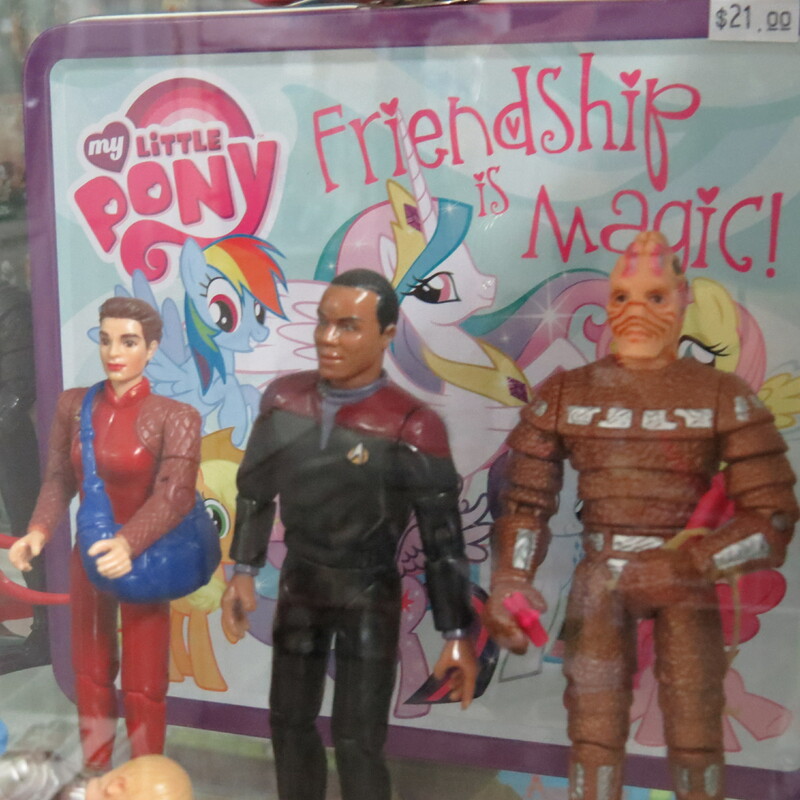 If the movies, music and care bears don’t take you back in time, maybe the very back of the shop will. 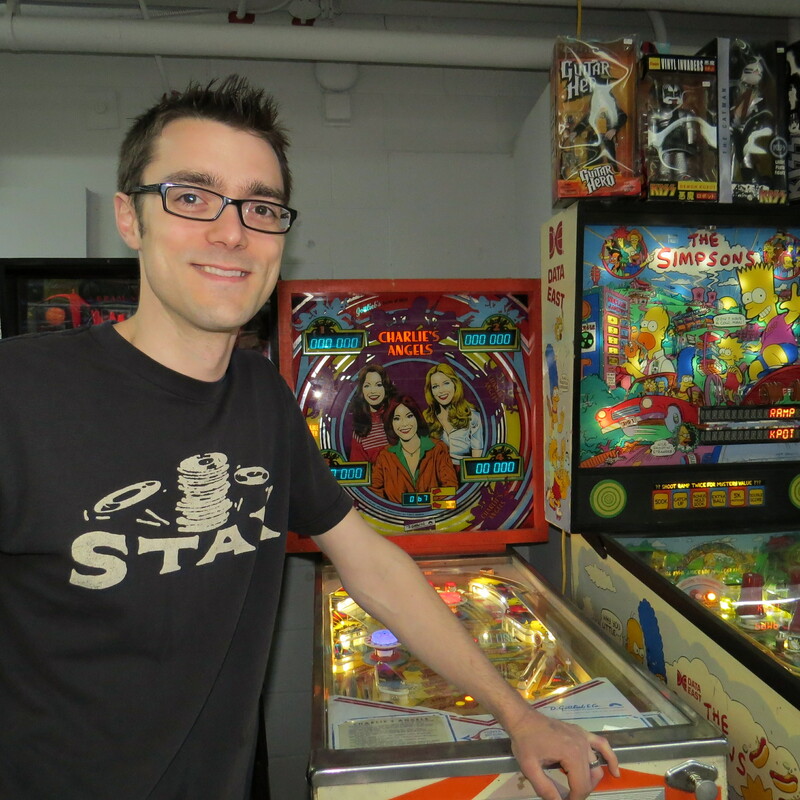 Recently Parisé installed a small arcade complete with orginal pin ball machines and games. Some, like my favorite one, Charlies Angels, are still 25 cents! 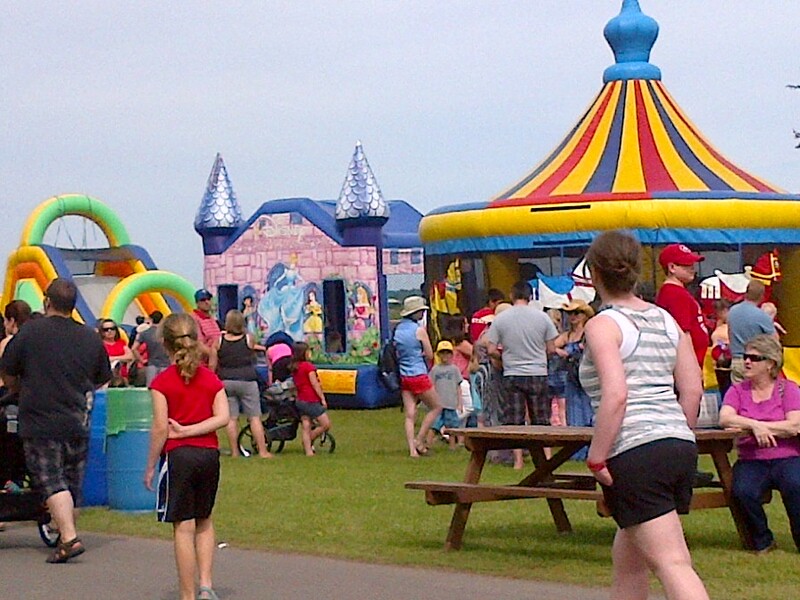 It Must be Spring – Moncton’s Fabulous Frye Festival is On! For a week each spring, writers, poets and essayists converge on Moncton to participate in the Frye Festival. Named after celebrated literary theorist and Moncton resident Northrop Frye, the Festival is Canada’s only bilingual international literary happening. It is also the largest event of its kind in Atlantic Canada and it attracts some of the country’s most respected authors. This year 60 authors from around the world are helping to feed our imaginations. Whether you are a child with picture books or an accomplished reader, there is something for everyone – kidsfest, writers’ workshops, book clubs, authors in conversation, readings, youth programs and plenty of evening activities. Yesterday, I volunteered to assist at a children’s book reading. It’s so wonderful to see how up close and personal you can get with the authors at the Frye. The relaxed maritime atmosphere allows for that. 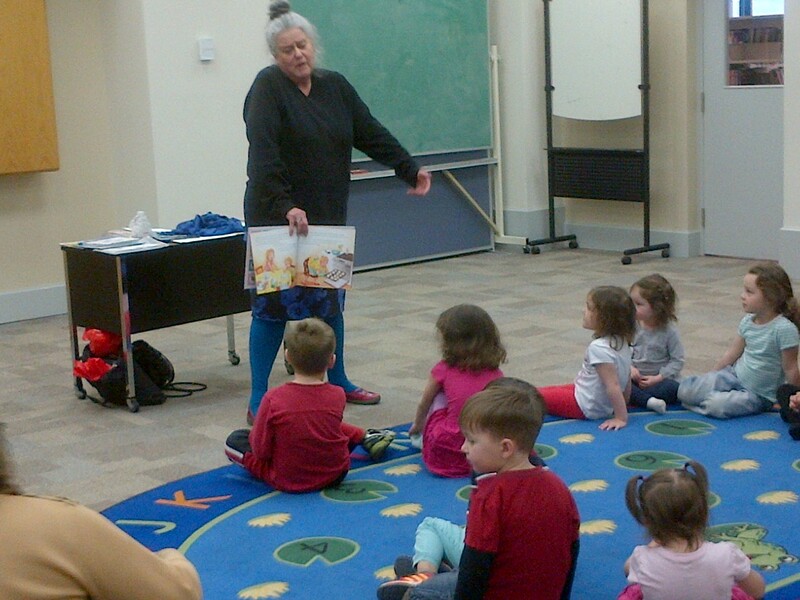 The kids were delighted to engage with authors Anne-Marie Sirois and Edith Bourget as they told their stories in that animated way that children can bring out in adults. They were rock stars to these little ones. 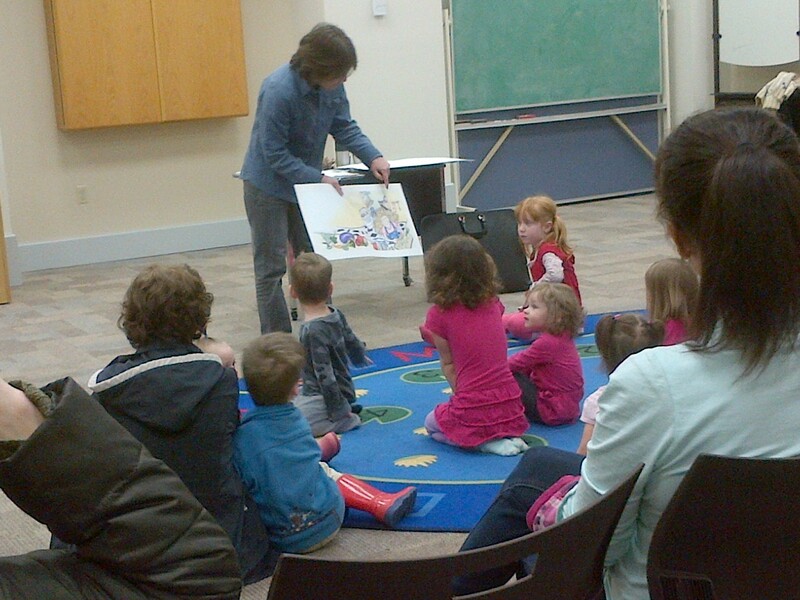 Edith Bourget had fun with her audience of three to five year olds. Big kids also have the opportunity to meet their literary heroes. Over the years, the Frye has attracted some notable names, including Margaret Atwood, Ross King, Jane Urquhart, Ian Hamilton and Emma Donoghue. “Meet the Authors” sessions are hosted throughout the week giving book-loving visitors plenty of opportunity to engage with their favorite writers. Another highlight for me was hearing investigative journalist Jacques Poitras talk about his researching and writing of the book Irving vs Irving. In addition to having incredible political and economic influence in New Brunswick, the billionaire Irvings have achieved an almost mythical status here. It’s no surprise it was standing room only to hear him speak. 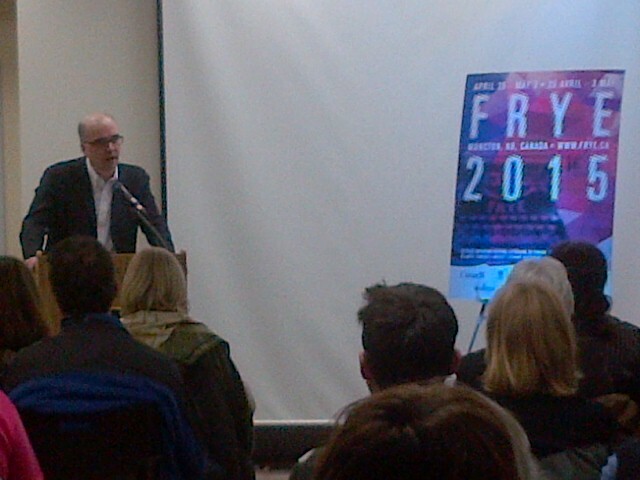 It was a full house when investigative journalist Jacques Poitras spoke about his best-selling book Irving vs Irving. This is the 16th Annual Frye Festival. And although it’s my first time here, I am starting my own springtime tradition. As the snow slowly melts away and the blooms sprout from the ground, I will head to the Frye, one of Canada’s best festivals, and feed my imagination. Exit #450 off the highway – Welcome to Moncton! In July 2014, my husband, our two young daughters and I moved to Canada’s East Coast in search of a simpler and more fulfilling life. For many years we lived in Toronto, one of Canada’s most densely populated and busiest cities. It’s a place full of opportunity, culture and diversity, and we spent many wonderful years there. But one thing was lacking for us – freedom. We were tied to demanding jobs, a costly mortgage and long commutes. Our kids spent more time at daycare and summer camps than at home. I remember reading somewhere that in order to move forward, you have to leave some things behind. So that’s what we did. Having both grown up in different communities on the East Coast, we knew moving back also meant being in closer proximity to family. After researching job opportunities, housing prices, crime stats, recreation and community services, Moncton, New Brunswick, topped the list as the best place to raise our family. Moncton is a very community-oriented city with a population of 70,000 – large enough to enjoy good recreational and cultural activities, and small enough that paying for public skating at the local rink still goes by the honor system. Both English and French are spoken here (New Brunswick is a bilingual province) and you will be greeted warmly whatever language you speak. I think Moncton is one of Canada’s best kept secrets. It’s not one I’m willing to keep though! I am excited to discover this place with you. Whether you are a tourist, newcomer or longtime resident, I hope you find something on this blog that will enable you to see this smart, friendly and innovative city in a new way.